14 March 1970 - Things had been changing (for the worse) steadily but surely since the April 1964 military putsch. Most of the Brazilian press that wholeheartedly embraced the coup d'etait 6 years earlier were now having 2nd thoughts about their folly in helping to oust a representative democracy and take a jump into the darkness of totalitarianism that no one knew where it would stop if stop it woud at all. TV Record knew it was losing ground rapidly to Rio de Janeiro's TV Globo the darling of the regime. TV Excelsior which had been the #1 TV station prior to the coup was about to die, TV Tupi was just 'hanging there'. Brazil was fast going from a democracy (since 1946) into a one-party-state and now a one-TV-network-country. Just before Christmas 1969 the military had turned even more sanguinary and introduced total censorship of the press through infamous AI-5 (Act #5). Many people saw no other way out by leaving the country. 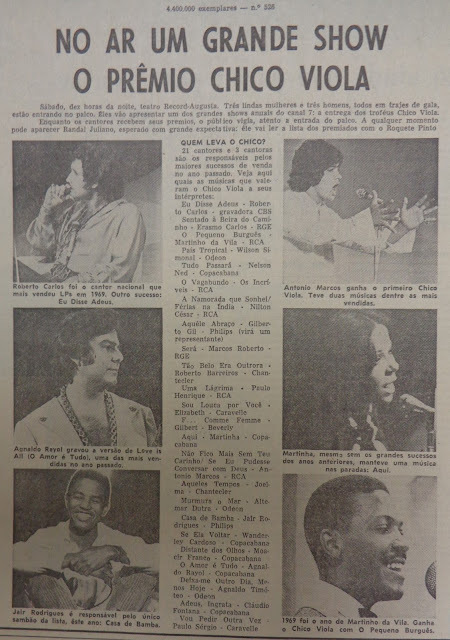 Singer Gilberto Gil who was forced to leave the country and seek asylum in London, England afer having been kidnapped by a para-military group had the 2nd best selling single in 1969 with 'Aquele abraço' - the song he ironically wrote to say 'good-bye' to Brazilians before leaving the country. Geraldo Vandré's 'Caminhando' was banned by the Junta and TV Record would not hear of including it in the Chico Viola's list of best selling 1969 records. 1970 would be the year that the Dictatorship would 'consolidate' its power due to the popularity of the Brazilian football team at the World Cup in Mexico.